We were honoured to welcome Cornwall’s Lord Lieutenant, Lady Mary Holborow, and the Chair of Cornwall Council, Councillor Pat Harvey to the Museum on 22 July, when Lady Mary presented Museum Chairman, Roger Radcliffe, with a beautiful piece of inscribed crystal and a certificate signed by HM The Queen to mark the Queen’s Award for Voluntary Service. Surrounded by some 70 Museum volunteers, Lady Mary read out the Museum’s citation and spoke of her pleasure that the Museum had gained the award. 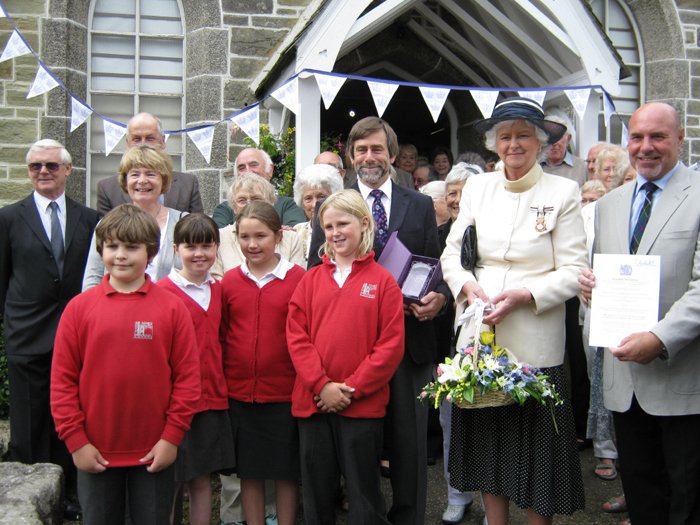 Four children from St Agnes Primary School were involved in the presentation – the boys entrusted with holding the crystal and the certificate by Lady Mary, while the girls presented her with a basket of Cornish flowers. Roger Radcliffe paid tribute to all the volunteers who worked so hard to make our Museum such a success and said that many were serial volunteers who helped with many village groups. 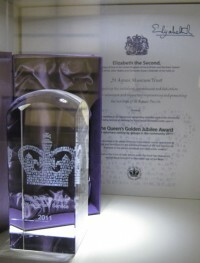 Liz Thompson thanked Lady Mary for suggesting, some two years ago, that the Museum might be nominated, as it had never occurred to us that a museum might be suitable. Everyone moved outside for group photos and a chance to admire the unique bunting, in purple and white and featuring the QAFVS logo, specially made by Clare Murton and Ann Oxley, our joint Curators. Afterwards, delicious food and drink were served upstairs, the organisation overseen by Clare Murton, and the food contributed by many helpers. It was a memorable morning and our grateful thanks are due to Mandy Kimmins, our nominator, St Agnes Primary School and the Local Improvements Committee for their letters of support, and everyone who has helped in any way. 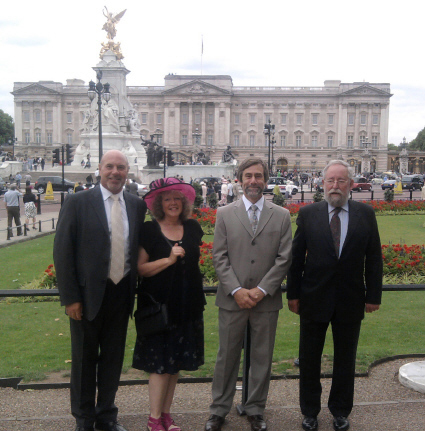 On 12 July Roger Radcliffe, Chairman, Clive Benney, Vice Chairman, Ann Oxley, Curator, and Colin Harris, Past Chairman, representing St Agnes Museum volunteers, attended the Queen’s Garden Party at Buckingham Palace, an acknowledgement of the award of the QAFVS. 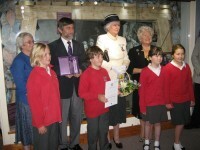 We were delighted to welcome the Reception Class of St Agnes Primary School to the Museum on 13 July. The 28 youngsters drew the figurehead and the turtle, explored the Museum, with a special look at the Natural History display, and listened attentively to our story “Sam and the Leatherback Turtle”. It was great to see them!